CHARLOTTE, N.C. (AP) — Graham Gano connected on a career-long 63-yard field goal with 1 second remaining to lift the Carolina Panthers to a wild 33-31 victory over the New York Giants on Sunday. 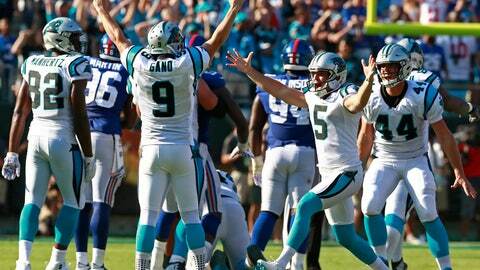 Gano’s winning kick, tied for second longest in league history, came after the Giants erased a 14-point deficit. Eli Manning hooked up with Saquon Barkley on a 15-yard touchdown pass down the right sideline — the rookie made a long dive into the end zone — to put the Giants in front 31-30 with 1:08 remaining. Gano’s previous career long was 59 yards. He was 4 for 4 on field goal attempts and has made 35 in a row at home dating back to 2016. Cam Newton threw for 237 yards and had two touchdowns and two interceptions. Christian McCaffrey had 93 yards from scrimmage and an 18-yard touchdown catch for the Panthers (3-1). Manning finished 22 of 36 for 326 yards with two touchdowns and two interceptions, both by Panthers 37-year-old safety Mike Adams. Odell Beckham Jr., had a big game as a receiver and passer. Beckham had eight catches for 131 yards and a touchdown and also threw a 57-yarder to Barkley for New York’s first touchdown. Deshaun Watson threw for 375 yards with a touchdown and an interception for the Texans (2-3) in their second straight overtime victory. Dak Prescott had 208 yards passing and a touchdown but threw two interceptions for the Cowboys (2-3). Elliott was limited to 54 yards rushing. CLEVELAND (AP) — Rookie Greg Joseph’s 37-yard field goal — a knuckleball that barely cleared the crossbar — with 2 seconds left in overtime. After rookie quarterback Baker Mayfield drove the Browns (2-2-1) into position, Joseph, signed after Week 2 following Zane Gonzalez’s release, lined his kick through the uprights to give Cleveland its first AFC North win in 19 tries. As Browns fans celebrated just the team’s second win in two seasons, Joseph was mobbed by his teammates following Cleveland’s third OT game in five weeks. PHILADELPHIA (AP) — Kirk Cousins threw for 301 yards and one touchdown, Linval Joseph returned a fumble 64 yards for a score and the Vikings won a rematch of last season’s NFC championship game. Carson Wentz and the rest of Philadelphia’s offense again struggled as the defending Super Bowl champions fell to 2-3. Nick Foles led the Eagles to a 38-7 rout over Case Keenum and Minnesota’s top-ranked defense in the title game on his way to earning MVP honors against New England. Trying to rally from a 17-point deficit midway through the third quarter, the Eagles were set up to take the lead after Roc Thomas dropped a backward pass and Nigel Bradham recovered the fumble at the Vikings 30 in the fourth quarter. But Wentz was called for intentional grounding and coach Doug Pederson elected not to let Jake Elliott try a 58-yarder. Dan Bailey, who missed two field goals earlier, nailed a 52-yard field goal to extend the lead to 23-14 with 2:47 left. Wentz fired a 7-yard TD pass to Zach Ertz to cut it to 23-21 with 1:09 left but Adam Thielen recovered the onside kick for the Vikings (2-2-1). SEATTLE (AP) — Todd Gurley rushed for three touchdowns, Jared Goff passed for 321 yards and a score and the Rams remained unbeaten. Playing without their top two receivers due to concussions suffered late in the first half, the Rams leaned heavily on Goff, Gurley and wide receiver Robert Woods to escape Seattle and improve to 5-0. Gurley scored on a 2-yard run in the first quarter, and added TDs of 2 and 5 yards in the second half. Gurley’s third rushing TD on the second play of the fourth quarter pulled the Rams within 31-30. But new kicker Cairo Santos hooked the extra point attempt and Seattle maintained a one-point lead. Santos atoned for the miss with a 39-yard field goal with 6:05 remaining to give the Rams a 33-31 lead, capping a 61-yard drive that took 4 ½ minutes. Russell Wilson threw for three touchdowns and Seattle (2-3) had a running back top 100 yards rushing for a third straight game as Chris Carson rumbled for 116 yards. CARSON, Calif. (AP) — Philip Rivers threw for 339 yards and two touchdowns, the 59th 300-yard passing game of Rivers’ 15-year career and his eighth against the Raiders. He completed 22 of 27 passes and had a passer rating of 143.4. Melvin Gordon had 120 yards from scrimmage (58 rushing, 62 receiving). His 1-yard run during the second quarter gave Los Angeles (3-2) a 17-3 lead at halftime. Derek Carr was 24 of 38 for 268 yards for the Raiders (1-4). He accounted for Oakland’s lone touchdown in the fourth quarter on a 1-yard pass to Jordy Nelson which brought the Raiders within 27-10. He also had a costly interception in the end zone to Melvin Ingram during the third quarter. The Chargers turned that into a 96-yard, eight-play drive to Rivers’ 13-yard TD pass to Virgil Green early in the fourth period. SANTA CLARA, Calif. (AP) — Josh Rosen threw a 75-yard touchdown pass to fellow rookie Christian Kirk on Arizona’s first play from scrimmage and the Cardinals used five takeaways to get their first win. The Cardinals (1-4) were unable to do much more on offense the rest of the way, with their only other scores coming on Josh Bynes‘ fumble return for a TD and David Johnson TD runs on two short drives after turnovers by the 49ers (1-4). But that proved enough against a San Francisco offense that did little after an opening drive score behind backup quarterback C.J. Beathard. Arizona defensive end Chandler Jones had a dominant day. He had a strip sack and fumble recovery against Beathard in the third quarter, and then batted away the 2-point conversion pass to Pierre Garcon to preserve a 14-12 lead. KANSAS CITY, Mo. (AP) — The Chiefs‘ beleaguered defense forced Jacksonville quarterback Blake Bortles into five turnovers, including a pick-6 by defensive tackle Chris Jones, and Kansas City merely had to supplement with the NFL’s highest-scoring offense. Patrick Mahomes threw for 313 yards and ran for a touchdown, though he also threw his first two picks of the season. Kareem Hunt added 87 yards and a touchdown on the ground as the Chiefs (5-0) marched all over the league’s top-ranked defense at soggy Arrowhead Stadium. Tyreek Hill, frequently matched up with the Jaguars‘ Jalen Ramsey in an entertaining one-on-one affair, had four catches for 61 yards in a game that grew testy on both sides. Jones was ejected in the second half after he dropped an elbow on a Jaguars lineman while both were on the ground following an extra point attempt. Pass rusher Dee Ford joined him in the locker room later in the half when he was whistled for his second unsportsmanlike conduct penalty. Hunt was flagged for head-butting linebacker Telvin Smith Jr. earlier in the game. Jacksonville (3-2) trailed 20-0 at halftime. DETROIT (AP) — Matthew Stafford threw two touchdown passes and LeGarrette Blount ran for two scores. Detroit (2-3) earned a win it desperately needed under first-year coach Matt Patricia, going into its bye week. Green Bay (2-2-1) could not overcome uncharacteristic mistakes by veteran kicker Mason Crosby and two-time NFL MVP Aaron Rodgers, who lost two fumbles for just the third time in his 14-year career. Crosby missed a career-high four field goals in one game and botched an extra point to boot. Blount had a pair of 1-yard TD runs in the first quarter and Stafford’s 8-yard pass to Marvin Jones late in the second quarter put Detroit up 24-0. Aaron Rodgers, missing injured receivers Randall Cobb and Geronimo Allison, threw short TDs to rookie Marquez Valdes-Scantling and Lance Kendricks in the third to pull the Packers within 10 points. Stafford answered with a 5-yard TD pass to Kenny Golladay. EAST RUTHERFORD, N.J. (AP) — Isaiah Crowell ran for a franchise-record 219 yards, including a 77-yard touchdown, and Sam Darnold threw two TD passes to Robby Anderson, including a 76-yarder. Darnold also had a TD toss to Terrelle Pryor that sealed the game late in the fourth quarter for the Jets (2-3). The rookie quarterback finished 10 of 22 for 198 yards and the three scores with an interception to help New York to its first win since the season opener. The Jets’ defense came up big, too, while playing without coordinator Kacy Rodgers, who is dealing with what coach Todd Bowles has called a “serious” illness. Bowles ran the defense against the Broncos and the Jets kept the pressure on Keenum all game, sacking him four times, two by Leonard Williams. CINCINNATI (AP) — Michael Johnson returned an interception for the tying score, and Sam Hubbard went 19 yards with a fumble for the clinching touchdown, rallying the Bengals from a 17-point deficit. With Joe Mixon back from knee surgery, the defense making more game-turning plays in the fourth quarter, Cincinnati (4-1) pulled off its biggest comeback of the season and extended its best start since its 2015 playoff season. The Dolphins (3-2) had plenty of blame to go around for their second-half meltdown, helping the Bengals score those 27 consecutive points with mistakes. Andy Dalton threw an 18-yard touchdown pass to Mixon to start the comeback, completing a drive extended by T.J. McDonald’s personal foul on a third-down incompletion. Mixon returned after missing two games following knee surgery and ran for 93 yards in addition to catching three passes. The Dolphins started the season 3-0, but have gotten flattened by New England and shocked by the Bengals in the past two weeks. PITTSBURGH (AP) — Ben Roethlisberger and Antonio Brown connected on two second-half touchdowns and the Steelers pulled away from the Falcons. Roethlisberger finished 19 of 29 for 250 yards and three scores, including a 9-yard strike to Brown in the third quarter and a 47-yard dart to the All-Pro wide receiver early in the fourth as Pittsburgh (2-2-1) put together its most complete performance of the season. Brown caught six passes for 101 yards. His two touchdowns gave him 64 in his career, moving him past Hall of Famer John Stallworth and into second place on the franchise’s all-time TD reception list. James Conner ran for 110 yards and two scores and added 75 yards receiving for Pittsburgh, which improved to 7-0-1 all-time against the Falcons (1-4) at home. Matt Ryan passed for 285 yards and a touchdown but was also sacked six times and spent the final minutes of Atlanta’s third straight loss on the sideline. Pittsburgh cornerback Joe Haden kept Falcons star wide receiver Julio Jones in check. Shadowing Jones — who entered the game leading the NFL in yards receiving — Haden held Jones to five receptions for 62 yards, all in the fourth quarter with Atlanta well behind. ORCHARD PARK, N.Y. (AP) — Stephen Hauschka hit a 46-yard field goal as time expired. Buffalo’s defense forced three turnovers, and LeSean McCoy broke from a September slump with a season-best 85 yards rushing. McCoy sparked the decisive drive with a 13-yard catch on third-and-3. And backup running back Chris Ivory had a 9-yard run in getting the Bills across midfield. Rookie quarterback Josh Allen scored on a 14-yard touchdown run but was held in check as a passer. He finished 10 of 19 for 82 yards and an interception. Buffalo (2-3) bounced back from a 22-0 loss at Green Bay last weekend. The Titans struggled on offense in failing to build off a 26-23 overtime win over the defending champion Philadelphia Eagles. After winning each of its past three by three points, Tennessee (3-2) found itself on the losing end of a tightly played game in which the kickers accounted for six field goals and the teams combined for 444 yards offense. Ryan Succup scored all of Tennessee’s 12 points by hitting four field goals, including a 50-yarder that put the Titans up 12-10 with 4:43 remaining.